Representing the growing nature of cell phone towers sprouting up in the environment, Troffkin’s symbolic piece is made of powder-coated steel and was installed in 3 sections. On first sight the image of a red and white communications tower crawling like a trailing plant along the forest floor may seem curious, even bizarre. In Communications Vine artist Eric Troffkin comments on Michigan as a place where both the natural environment and industrial technology have long been central to our identity. He asks us to consider the relationship between the technology of the built environment and the natural environment. “It is easy to feel that natural, wild things and the things that we make in industry, technology and commerce are very different”. Our presence here in the forest, inspired by both the natural environment and created sculpture can serve as a metaphor reminding us that we are not separate from nature, rather we are an integral part of it. As makers and inventors we are as dependent on the natural for our needs are all other beings. Consider how we have continuously expanded our means of communication by using the environment. The twist and turns in Communication Vine can be seen as reminiscent of the meandering of Michigan’s rivers along which indigenous peoples and European settlers traveled to communicate. Then there are the trails and roads that followed the natural topography to bring people together. Railroads and modern highways straightened the lines of communication by using Michigan’s abundance of wood, iron and stone to create steel and concrete. Michigan copper is essential for wired communication and now that technology has found a way to use natural air waves, radio and microwave, we communicate almost without physical limitations. Communications Vine is a project that continues my interest in communications equipment. 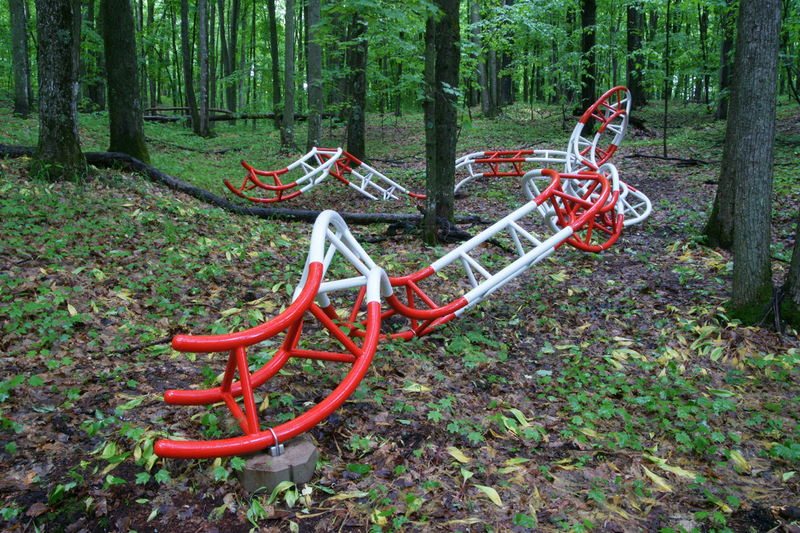 Making sculpture is a way for me to investigate this interest – I see red and white towers and other kinds of communications technologies, like satellite dishes, everywhere. They sprout from building rooftops and alongside highways in a way that feels very plant-like to me.